If you own a small business, you may be overwhelmed by the prospect of establishing a retirement plan for yourself and your employees. There are many options out there, each with their own advantages and disadvantages. It can be challenging to know which one is best for your needs, offering the most flexibility, the optimal tax savings, and the lowest administrative costs. Determining which small business retirement plan is right for you depends on a number of factors, including the number of employees you have, the size of your business, and your ability and willingness to devote time and attention to administering the plan. For most business owners, a consultation with a benefits consulting firm can be invaluable; an experienced benefits consultant can provide advice and guidance on the best choice for your company. Before scheduling an appointment with a benefits consultant, spend some time learning about the types of retirement plans available along with what you should consider before choosing a plan. This article explains several basic retirement plans for small businesses, helping you to understand your options so that you can make the best possible decision. For small business owners without employees, an individual retirement account may be the logical option. A self-directed or personal individual retirement account is commonly referred to as an IRA. In this type of plan, the account owner manages all investment decisions, typically by choosing a type of investment strategy. The funds are held by a qualified trustee or custodian, which is often a bank of investment firm. There are two primary types of IRA accounts that your small business may establish: traditional IRAs and Roth IRAs. 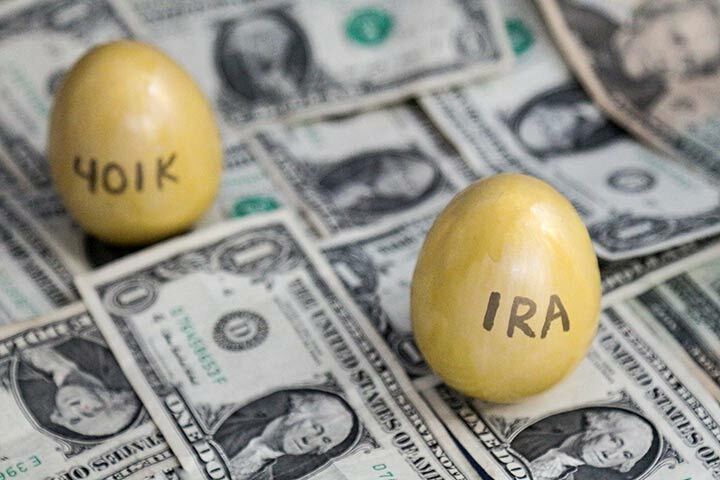 Traditional IRAs permit account owners to make tax-deductible contributions to their retirement account up to a limit based on that person’s adjusted gross income. The account grows on a tax-deferred basis until retirement, at which point the funds are taxed upon withdrawal. There is no penalty for withdrawing funds after age fifty-nine and a half. This option is a great choice for anyone who wants to defer paying taxes until after they retire, when they will typically have a lower income. In contrast, contributions to Roth IRAs are not tax-deductible. Withdrawals are not taxed, however, as long as they are made once the account owner has reached retirement age. If a person withdraws funds from their Roth IRA prior to this time, they may be subject to taxes and penalties. Roth IRAs are a better choice for individuals who want to pay taxes upfront on their income rather than paying taxes during retirement. A Simplified Employee Pension Plan, or SEP, is a type of IRA that is commonly used by people who are self-employed or who own businesses without employees. Contributions to these plans are made only by the employer, capped at either 25% of salary or 18% of net profits (for a person who is self-employed). The maximum contribution per year is $53,000 for 2016. A business owner who has sponsored a SEP IRA can change the amount that is contributed each year, and does not have to make a minimum contribution. This option is typically not ideal for small business with employees because each employee must receive the same percentage contribution as the owner. This makes a SEP IRA an incredibly expensive choice for small business owners, as their own retirement account is essentially tied to those of their employees: if they contribute 20% of their salary to their account, then each employee must be given 20% of their salary for their SEP IRA account. While you can decide to not contribute to an account one year, this means that you also cannot contribute to your own account. These accounts are 100% funded by the employer; employees cannot make contributions to their SEP IRA. Although this is a pricey option for any business with employees, it does have advantages. SEP IRAs are fairly simple to set up and to administer. They do not require the employer to file any reports with the IRS. They are also incredibly flexible, because employers can choose whether or not to contribute to the plan, and how much to contribute each year. If you are self-employed or own a small business with either no employees or few employees, a benefits counselor can advise you as to whether a SEP IRA is the correct choice for your company. The Savings Incentive Match Plan for Employees is known as the SIMPLE IRA. It is funded by both the employer and employees, making it a less expensive option than a SEP IRA for employers. Employers are required to contribute to employee accounts in one of two ways: either through a flat 2% contribution or matching contributions of up to 3% of an employee’s salary. Employees can contribute up to a certain amount each year; the limit for 2016 was $12,500 in annual employee contributions. Employees over age 50 can contribute an additional amount each year ($3,000 in 2016). Employers who choose to offer SIMPLE IRAs as a retirement plan must offer it to all employees who earn over $5,000 in salary per year. Like the SEP IRA, there are no IRS filing requirements for a SIMPLE IRA, and it is relatively easy to set up and run the program. It offers less flexibility than a SEP IRA because employers must make a contribution each year at a set amount, but the contributions tend to be much lower and are not tied to how much the employer places in his or her own retirement account. These plans are available for employers with fewer than 100 employees. A benefits consultant can help you determine the costs of setting up and contributing to SIMPLE IRA plans for your employees. This type of retirement plan is named after a section of the United States tax code and is far more common than alternative options. There are many types of 401(k) plans available. In traditional 401(k) plans, employees contribute a portion of their salary to their accounts, and employers can contribute either a set or a matching amount to employee accounts each year. Employers have the ability to retain those contributions if an employee leaves the company before a specified period of time. In traditional 401(k) plans, employee contributions are deducted on a pre-tax basis from their wages. This reduces the overall tax burden for individual employees. The IRS places a cap on the amount that an employee can contribute each year; in 2016, it was limited to $18,000. These plans require employers to file documentation with the IRS each year, and submit to an annual qualifying test. Traditional 401(k) plans can be more expensive for employers to administer than other types of retirement plans. There are also many types of non-traditional 401(k) plans that may have advantages for small business owners. A solo 401(k) plan is often the correct choice for companies with no employees, because only the owner of the business and his or her spouse can contribute to the plans. These plans have much higher contribution caps, with tax-deferred contribution limits as high as three times those of other plans. Business owners can borrow against their accounts with solo or individual 401(k)s.
Safe Harbor 401(k) plans are ideal for those companies that want to avoid being subjected to the annual IRS test mandated for companies with traditional 401(k) plans. Employer contributions to these plans are vested as soon as they are made, so that employees can take the money with them regardless of when they leave the company. Tax-exempt contributions can be made up to the same limit as with a traditional 401(k), and employees over age 50 can contribute additional amounts. Employers must contribute to all Safe Harbor 401(k) accounts for eligible employees, up to a yearly limit ($53,000 in 2016). These plans are simpler to set up and administer than traditional 401(k)s.
Regardless of whether it is a traditional or non-traditional account, 401(k) plans require owners to comply with IRS filing requirements and pay fees to administer these plans. These costs can add up if small business owners are not careful. A benefits consulting company can assist small business owners in determining what the true cost of a particular 401(k) plan will be and help them select a401(k) plan that is appropriate for their specific company and employees. For small businesses that wish to incentivize their employees to maximize the company’s growth and profits, a profit-sharing plan might be a good choice. For employers whose employees have worked at least 1,000 hours in the previous year, a profit-sharing plan allows them to contribute up to 100% of an employee’s compensation (to a limit of $53,000 in 2016) to a retirement account. These plans are often a good way to encourage employees to take an active role in the overall viability of the business, rather than simply working for a paycheck. Picking a retirement plan for your small business requires careful consideration of a number of factors. Employers should determine what level of plan administration they are willing to undertake or what amount they would be willing to pay to have another entity administer the plan on their behalf. Business owners should also consider how much they are willing to contribute to employee plans — if anything — and how much flexibility they desire in making contributions. A benefits consulting firm can help small businesses consider these and other factors, along with the tax implications of each potential plan. Who Can Benefit From a Small Business Retirement Plan? Many small businesses owners work hard to make a profit and may be reluctant to funnel those funds into a retirement plan. However, in many cases, setting up a retirement plan for your employees is a smart business decision that can help you attract and retain top talent. A retirement plan is a fundamental component of any comprehensive employee benefits program, and many high-quality employees will not consider working for your company without a decent plan in place. Beyond attracting employees, a retirement plan can be personally beneficial to business owners — including giving them the incentive to start and/or contribute to their own retirement plans. There are many tax advantages to employee retirement plans that can help offset the costs of administering and contributing to your employees’ retirement. Read on to learn more about affordable options that can help you grow your business. Selecting a retirement plan for your small business can be challenging. A benefits consulting firm can assist you with the process, offering a range of options that suit your company’s needs. Contact a benefits consulting firm today to learn more about retirement plans for small businesses, and how this type of benefit can be an important tool in attracting and retaining highly-skilled employees.